Math was never my strong suit, though I did well enough to...become our family's chief financial officer. That sounds so impressive, right? Yeah, I pay the bills and balance the checkbook and do our yearly financial analysis (complete with pie chart!) and try to figure out where our money goes. That doesn't take a financial genius - even someone who took college calculus with extra help (with the football players) can do it. In fact, my husband, former math team captain and almost perfect math SAT score guy, is happy to cede the role to me. I do know the role that math plays in adult life, and I'm constantly trying to stress this to my daughter, who did not inherit her father's math skills (poor kid). 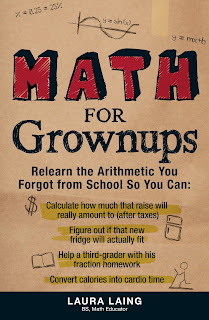 When I heard about Laura Laing's new book, Math For Grownups , I cracked up. I love the title, and I love that a teacher and freelance writer would come up with a book to help those of us who didn't ace our math class. So I asked Laura to do a Q&A with me. By they way, Laura does a great blog where she continues the math conversation, even interviewing regular folks who who use math in their everyday life. Check it out. A: This is not the book expected to write! I had another idea in mind -- a book for parents who don't understand their kids' basic math. Today, math is being taught differently than it was, and many parents feel like they can't help their kids with their homework. I wasn't able to find a publisher for that book, but an editor at Adams Media suggested me as the writer for Math for Grownups . As soon as I started thinking about the book, I was hooked. I'm a former high school math teacher, and I'm absolutely fascinated with how people think about math and solve problems. For the most part, I don't like algorithms, or step-by-step processes for solving problems. Instead, I think it's far more useful for folks to tap into their own math strengths and intuitions. Of course that requires people to have some level of confidence in their math skills -- and fact is, most don't. So I approach this book knowing that my readers are probably scared of math and don't want to do it. The idea is to help them feel more confident in their problem-solving skills. Q: Why would an adult who hated math class want to read it? A: I firmly believe that people don't have to love math to use it. In fact, I would say that most people not only dislike math but may even hate it with a white, hot passion! And why do they hate it? Because it makes them feel stupid or incompetent. All that is fine and good, except that we grownups have to use math on a daily basis. Math helps us manage our money and time. It helps us make the world around us, our yards and homes, beautiful. It helps keep us fit. These statements may seem like I'm stretching things, but if you think about it, it's all true. When you buy a home, you need to accurately calculate your monthly payment. When you install a sprinkler system, you want to know that it's efficient and will provide enough water for your plants. When you redecorate a room, you don't want to run out of paint. And when your doctor tells you to lose a few pounds, you need to know how many calories to consume and burn. Each chapter of my book focuses on a particular area of life: from buying a car to taking a trip to making crafts. And within the chapters, you'll read dozens and dozens of examples of how you can use math in these situations. Trust me - this isn't a boring textbook. Q: Give me some examples of how we use math in the real world, but it doesn't really seem like math? I won't lie: a lot of the examples in my book are very obviously math-based. 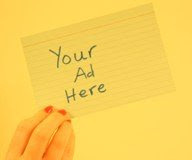 I've introduced some important formulas, like area, volume, interest and monthly payment. But there are some examples that might surprise you. In one, my brother Graham is canning tomatoes. He finds a variety of jars in his basement, but they're not all the same size. He needs to know if he has enough jars to can his abundant crop of tomatoes. In another, I look at whether a weight-loss advertisement makes sense. The ad says that you can lose at least 7 pounds of fat in a week. But if one pound of fat equals approximately 3,500 calories, you'd have to cut your caloric intake by at least 3,500 calories a day for that promise to hold up. Most people know that women typically take in 2,000 calories a day, and men 2,500 a day This little comparison tells me that the ad's claims are bogus. Q: How can I make math fun for my kids? First of all, don't tell them that it's fun. Most people don't have fun doing arithmetic (if your kids do, you don't need to do anything special to boost their math enthusiasm!). The kids who need an outside injection of fun are not going to buy into any contrived math games. Instead of worrying about making math fun, I encourage parents to foster curiosity. It's not about what kids know, but that they maintain an interest in learning more. If your child asks you how fast a cheetah can run, don't just look up the answer and be done with it. Instead, think about the answer and try to extend it to their daily lives. Apparently, cheetahs can run up to 75 miles an hour! That means they're running faster than most state's interstate speed limits. You can extend this question by asking how many miles a cheetah will have run in 30 minutes. What you're doing is fostering numeracy, or your child's understanding of numbers. This is a really critical piece of math success in later years. The key is to be matter-of-fact. Allow your kids to play with math concepts. De-emphasize right and wrong answers. Encourage them to problem solve with everyday situations. When my 11 year old daughter asked to redecorate her room this year, I told her that she could, on two conditions. She had to help with the painting, and she had to do the math to find out how much paint to buy. I wouldn't say she had fun doing the math, but she did get a good idea of how it was useful. We even were able to talk about a variety of different ways to come to the answer. Q: You talk about math myths in your book - give an example. The biggest myth is that there is only one way to solve a problem. And I think this is what keeps grownups from feeling comfortable with their math skills. It's also what keeps many grownups from understanding their kids' homework. The classic example is finding a tip at a restaurant. Some folks pull out a piece of paper and a pencil (or a calculator) and find 15% of the total bill. Others use mental math to find 10% of the bill, then halve that and add it to the 10%. But if you live in a state with 7.5% food tax, all you need to do is double the tax on your bill. Does it really matter how you get to the answer? Nope. Heck, with most math, it doesn't even matter if your answer is precise. I always round the restaurant bill before finding the tip. The critical thing is to find a process that is logical for you. Of course that requires some amount of confidence in your skills, and a willingness to be wrong once and a while. I hope that my book gives people permission to experiment a little and a little bit of math-esteem. Sounds good, huh? 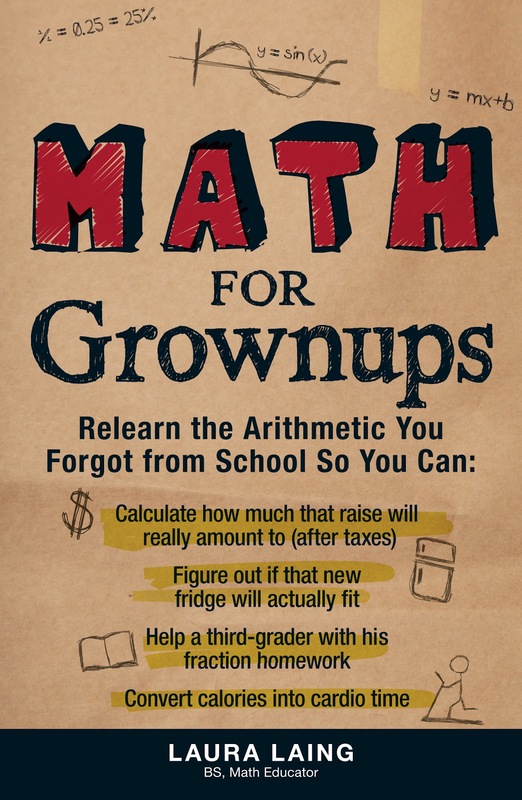 If you want to learn more, check out Laura's book, Math for Grownups . And her blog.